We stock a range of cardboard cartons, sheets and corrugated rolls all used to contain and protect items during transport and storage. We don’t have a suitable size in stock we can custom manufacturing to order cardboard rolls, sheets, boxes, dividers and more to suit your specific requirements. The length is the larger of the two dimensions of the open face (flap opening);The width is smaller. The height is always the distance perpendicular to the length and width. Height is also known as depth. We can custom make a large range of carton styles to suit each clients requirements. With custom printing also available, the options are endless. • RSC – Regular Slotted Container: RSC is a standard everyday carton. It is the most efficient and effective style of carton. The outer flaps meet at the centre, on top and bottom surfaces. • FFSC – Full Flap Slotted Container: The difference between the RSC and the FFSC is that the outer flaps fully overlap each other. If you are needing a carton with a narrow width FFSC recommended. • HSC – Half Slotted Container: This carton is recommended when a carton is being opened repeatedly e.g. self storage. It has flaps on one end and the other end is open allowing for a lid to be placed over the open end. • FPF – Five Panel Folder: These cartons are used when you have long narrow items. 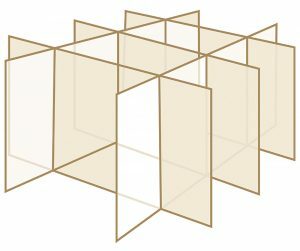 The carton is a flat board with creases at specific points; it is wrapped around the item then sealed on all three ends. • DC – Die Cut Boxes: This carton has the ability to be made into many unique designs to suit the product of your wish. It is specially designed for the purpose of shipping and display. This carton has a very clean and accurate finish. • CR/SL – Creased And Slotted Trays: The Creased & Slotted cartons are very like the HSC cartons, they are cut half way and the top section fits over the bottom section. These cartons are used mostly for Storage cartons and Spare part containers. • DC – Pads: The pad is a single corrugated sheet which can be made to the size of your requirement. These are used as a divider between your products to had needed protections. The most common pad is the pallet sheets that cover the top of the pallet. • Partitions/Dividers: The partitions are most common in the bottle and jar industry; it provides individual pockets for the items to be placed into for added protection. This is made of intersection sheets of board. They can be supplied assembled in the carton or loose for you to assemble manually. • CCF – Corner Cut Folder: The CCF carton is manufactured to suit the product of your choose. It is especially designed as a mailer and perfect for items with a narrow depth. Need Custom Made Cardboard Cartons or Sheeting?